Do you know what I love? Oreos. These little sandwiches of glorious perfection are my absolute favorite sweet treat. 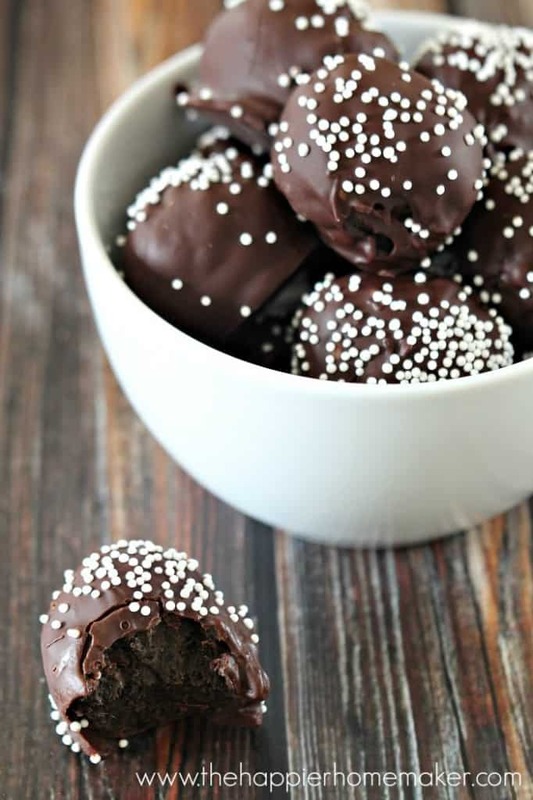 So when the family asked me to whip up a little chocolate dessert for them the other day I used it as an excuse to create these ridiculously easy to make Dark Chocolate Mint Oreo Truffles. Y’all are going to want to run to the store and make these today because they are just so darn easy-and they taste amazing and totally indulgent! Place the Oreos in a food processor and pulse until finely crumbed. Transfer crumbs to a stand mixer and add cream cheese, mix on medium speed until well blended, scraping sides as needed. In a small bowl, microwave the dark chocolate morsels 45 seconds at a time, stirring afterwards, until melted. Use a fork to dip the truffles in the chocolate and turn to coat. Scoop the truffle out using the fork (don’t pierce it, just scoop the fork underneath) and tap on the side of the bowl a few times to remove excess chocolate. Set the truffle on a wax paper covered plate to firm up. If you want to add sprinkles as I did, do it immediately after dipping before the chocolate hardens. Place truffles in the freezer 45 minutes to completely harden before serving. Keep in an airtight container in the refrigerator for up to one week. 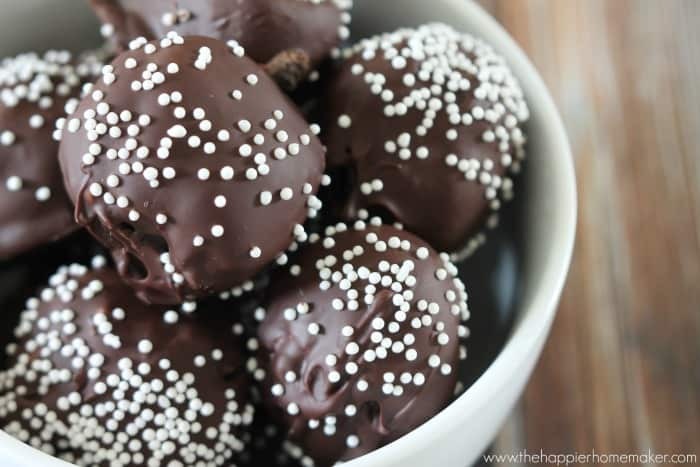 I hope you enjoy these truffles just as much as I do-they are just heavenly! 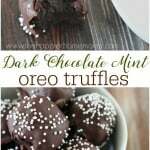 Get ready to make the easiest dessert ever-super indulgent Dark Chocolate Oreo Mint Truffles! Place Oreos in a food processor and pulse until finely crumbed. Transfer crumbs to a stand mixer and add cream cheese, mix on medium speed until well blended, scraping sides as needed. Roll cookie/cheese mixture into 1.5″ balls and place on wax paper lined plate. Freeze balls for 20 minutes. In a small bowl, microwave dark chocolate morsels 45 seconds at a time, stirring afterwards, until melted. Use a fork to dip the truffles in the chocolate and turn to coat. Scoop the truffle out using the fork (don’t pierce it, just scoop the fork underneath) and tap on the side of the bowl a few times to remove excess chocolate. Set the truffle on a wax paper covered plate to firm up. If you want to add sprinkles as I did, do it immediately after dipping before the chocolate hardens. Place truffles in the freezer 45 minutes to completely harden before serving. Oh man, these look amazing. Will definitely have to make some this weekend! They are so good Kristen-hope the kids like them as much as ours did! These look super delicious! I’ve made chocolate chip cookie dough pops which is basically the same thing, dipping in the melted chocolate and allowing them to harden, but these seem a bit easier to make since you just need to crumble the cookies first. I think these would go over wonderfully for the husband on Valentine’s Day although I’m sure the kiddos would be equally as thrilled. My family ate them up SO fast Corinna, I hope yours love them just as much! Have a great weekend! 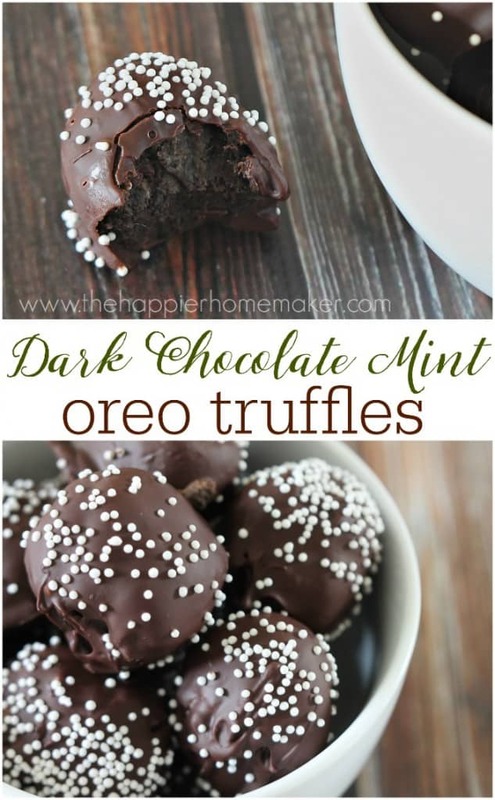 I love no bake treats and the combo of Oreo + mint is awesome! Pinned and can’t wait to make these! Thanks Keri! I hope you have a great weekend!